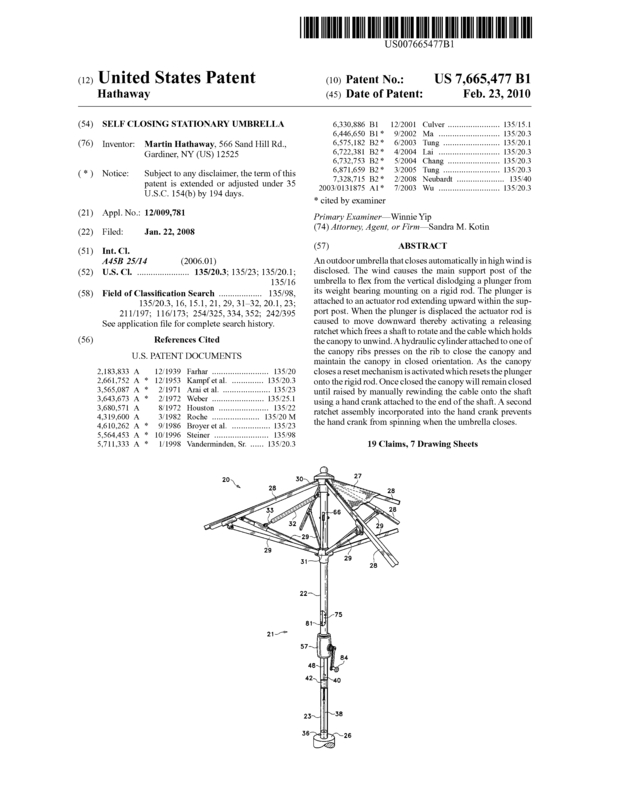 The windproof umbrella is a patio or market umbrella that automatically closes at wind speeds of approximately 30 mph. Until now, these umbrellas have been susceptible to strong wind causing both personal and property damage. I personally grew tired of repairing or replacing my old umbrellas: or running out in bad weather to close it before it was damaged. My solution is the windproof umbrella. It is totally machanical with no motors, wires, etc. I built the original and only working model about seven years ago in my garage. It is still working exactly as I envisioned with no failures or property damage to date.. I am looking to sell the patent outright. There has been interest in the invention but potential buyers wanted a set of manufacturing drawings for production. I cannot afford this expense. Page created at 2019-04-25 20:20:22, Patent Auction Time.